Would it be possible for you to add a downloadable source file (SVG, AI, etc.)? I used your work in a fan art. I put a link to your image. If you do not want. I will remove the image. sorry, I should have asked before. But to show you that I had mentioned, I first posted fan art. She seems to be enjoying herself. But I like to watch you while you sleep. There's some blue stuff on the corner of her eye. 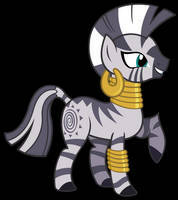 Ever notice how every episode that features Zecora is automatically awesome?